I have only been quilling for about a year. I got the design for this birthday card for mother-in-law from a quilling book and wanted to incorporate other designs into my card without taking away from the quilling. Enter, paper pricking. I found free downloadable patterns online, bought the pricking needle and practiced with it. 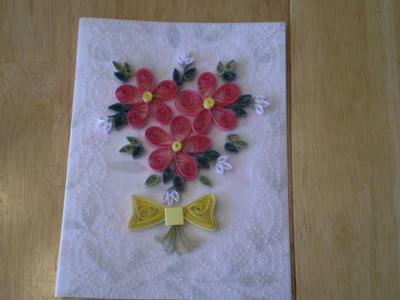 Since then I have experimented with other embellishments to add to my quilling, like beads and ribbon. These are simple additions that do not distract from the quilling work. My mother-in-law loved the card and I had fun making it. What a lovely birthday card! Combining quilling with paper-pricking certainly makes this birthday card for mother-in-law so exquisitely beautiful. I especially like the paper-pricked border. Thank you for sharing this lovely card with us, Michele.